The country's president said Iranians have the right to protest but not to cause damage or violence. Protests in Iran continued and grew more violent Sunday night. Ten people were reportedly killed, bringing the death toll up to 12 since the unrest started Thursday. Hundreds more have been arrested. Originally a small demonstration in Mashhad over economic problems facing the country, protests spread to other locations. Some protesters were seen on video burning buildings and damaging vehicles, while a few even called for the death of the country's top religious cleric and head of state, Ayatollah Ali Khamenei. BBC reports a growing desire among the mostly young male protesters for an end to the Islamic regime. Outwardly, Iran's government has had a mixed response to the unrest. Officials initially said protesters would "pay the price" for the "illegal gatherings." 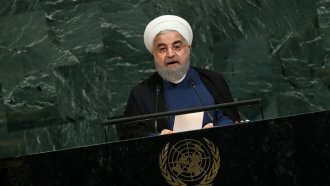 Later, Iran's President Hassan Rouhani affirmed the right of Iranians to protest peacefully but denounced the violence and property destruction.